Our fees are based on an hourly rate. See our pricing guide below. The final fee will reflect the total amount of time spent on the appraisal, including take-in, cleaning and inspection of the jewelry, research and documentation, photography, preparation of the final documents, contacting the customer and delivering the items. If you have multiple pieces of jewelry, we do advise bringing them all in at the same time. Appraising multiple items on the same report will save both time and money. Our express appraisal service is designed to allow you the opportunity to be present during the appraisal process, or to receive the final documents by the next business day. Our fee for this express appraisal service is higher than our standard appraisal fee. Please contact us for more information. This service is available by appointment only for customers who wishes to wait while we clean, inspect, research, evaluate, document, photograph, and prepare the final document. Most insurance Companies recommend that- and some companies require- that your jewelry be re-evaluated every two or three years. This is due to fluctuation or changes in market conditions and to verify that the quality of the items remains as stated in the report. 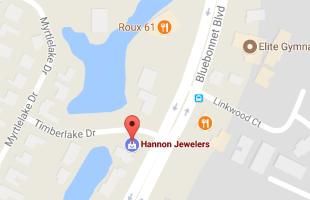 Hannon Jewelers would we recommend having your appraisals updated every other year. This will insure you have enough insurance protection when it is needed, and therefore this will avoid paying unnecessary, excessive premiums. We offer you a reduced fee for the re-evaluation of your items. Since we have on file pictures and detailed work already performed by us, the fee to update our own appraisal report is 1/2 the current rate at the time of the requested service. As a guide, the following are the most common fees for appraisal reports. These fees are for items to be kept by Hannon Jewelers during the appraisal process. Verbal Reports: This consultation of appraisal may be converted to a full-size, extensively detailed appraisal report at the time of the service is provided. *Note that these fees may vary and are subject to change at any time without notice.